When the rumble of distant thunder fills you with dread and a downpour has you scurrying for buckets to catch the leaks, then it’s inevitable: time for a new roof. How long that new roof keeps you feeling cozy and snug largely depends on the roofing material you choose. Durability is a significant factor when calculating the true cost of your roof. Consider the number of years you expect to stay in your home as well as your new roof’s potential to increase resale value. If you anticipate moving in the next few years, even a low-cost roof will be a selling point. However, if you plan to be in your home for many years to come, think about spending more up-front. It will save money in the long run if it’s the last roof you ever have to buy. An attractive option, wood shingles and shakes come with a price tag many times that of asphalt shingles, but with a similar lifespan. Risk of fire makes this roofing material subject to local building codes. Cost averages $550 per square for shingles and $750 per square for shakes. This type of roof is expensive to install and requires periodic maintenance. Metal, which can last up to 50 years, is a good choice for coastal and snowy climates. Compared to other roofing materials, metal is lightweight. Cost is in the mid- to high range, starting at $250 per square, depending on whether you choose steel, aluminum or copper. 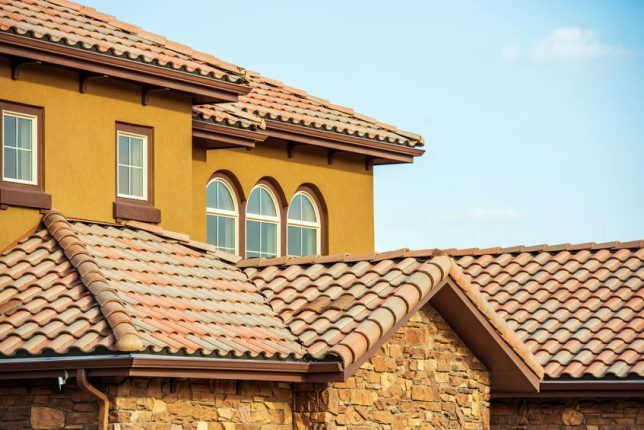 For a Mediterranean-style home, the characteristic barrel tile could ultimately be more cost effective since a well-laid tile roof can last 60-80 years. Tile is heavy and the house needs to be able to bear the extra weight. Cost can run up to $1,000 per square. Very expensive, but extremely durable, a slate roof will shelter generations. It can shed snow and ice. Slate requires a substantial roofing structure to support it. For a historic or well-built home, a beautiful slate roof could be worth the approximately $800 per square cost. New roofing products made of engineered materials come on the market all the time, and could stand in for the basic roofing materials described here. A roofing professional can guide you through all of the options and help you select the most durable roof for your budget. To get connected to a roofing contractor in your area whose workmanship is guaranteed for a full three years, simply enter your ZIP code above. All of the contractors in the Contractor Connection network have been vetted to ensure they have the proper licensing and insurance, and the experience to do your roofing job right.